The National Union of Metalworkers of SA (Numsa) has resolved to forge ahead with the plastic industry strike until workers’ demands are met. The union’s position was emboldened by the Labour Court ruling on Friday that the strike is legal. Employers had earlier applied for a court interdict to block the strike. 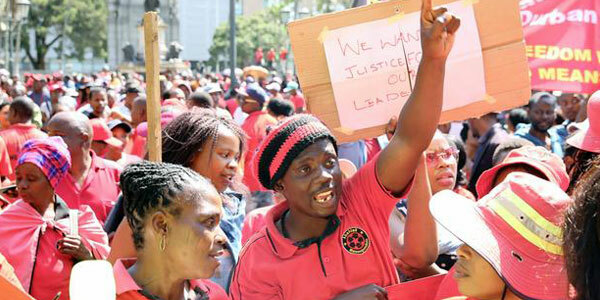 Numsa spokesperson Phakamile Hlubi-Majola said the employers’ application for an interdict was meant to victimise workers and stop them from making their demands. “In the meantime, we will be intensifying the strike. All our regions will spend the next few days mobilising all workers in the plastics sector. We are once more making a clarion call to all workers in the sector to join the strike and intensify it until the employers come to the table and make an offer,” she said. This week thousands of workers downed tools demanding a 15% salary hike. The workers also demanded that employers pay them R40 an hour instead of the new rate of around R20. On Wednesday workers at Mykas Plastics in Lenasia, south of Joburg, were picketing outside the gate. An aggrieved employee, Jack Mothusamang, said they were fed up with exploitation, adding that they were earning R506 a week. The company was not available for comment at the time of going to press.